The sweltering heat has my shoes sticking to my soles. I am retiring them for a pair of flip flops with a little bling. The problem is my heels haven’t seen the sun, and they are flaking like a fresh croissant with butter. I mean they are seriously in bad shape. We all know I live the good life on a limited budget, so I am trying to keep my summer spending to a trickle by doing my own pedicure. This is how to save money on a pedicure because we all need one and we all do not need to spend $50. The first thing you need to do is to assess the problem areas. Then run to Walgreens and buy the Amopé™ Pedi Perfect™ using this $15 off coupon it will cost you just $21.99. 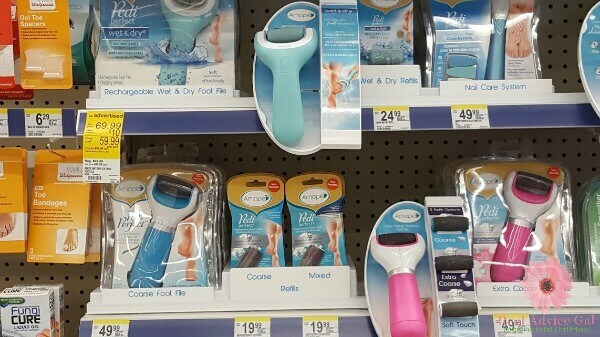 The reason why this is such a deal is because you can use this tool daily to keep your feet up so your feet will no longer peel like a flaky pastry. How else besides grabbing the deal on the Amopé Pedi Perfect can you give yourself a pedicure on a budget? You need soft and beautiful feet on your own time frame and in your budget. The Amopé™ Pedi Perfect Electronic Foot File is easy to use, but you should not use it near water. This is what I do. I turn it on and start with my heel and work my way toward my toes. It is effortless and removes the dead skin without pain or discomfort. I think it tickles a bit. The handle is ergonomically shaped so it can be easily handled. The diamond crystals yield maximum exfoliation. Do not worry there is a safety stop feature to protect you. Once you have gone over your feet a couple of times, then go ahead and soak them in warm water. I like to use a little olive oil in my water. Then I use a sugar scrub with equal parts brown sugar to coffee grounds. When I am done scrubbing my feet and washing them off. I dry them. I then take on my toe nails. I start by using Amopé™ Pedi Perfect Electronic Nail File, and I apply a pretty nail polish and I put on lotion. The hard work is done by the Amopé™ Pedi Perfect™. I do enjoy the savings and the ability I have to do my own pedicures whenever and wherever I need. Since the Amopé™ is portable, I take it with me on vacation. That is How to Save Money on a Pedicure by buying the tools you need to get professional results at home. 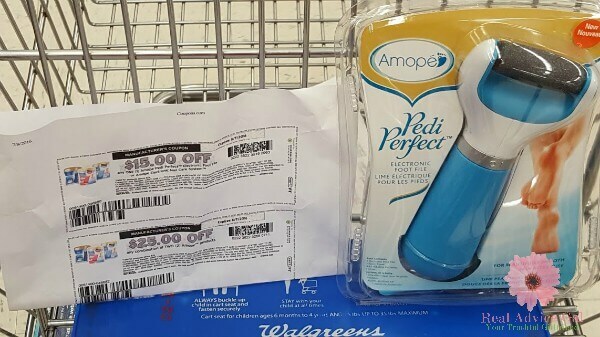 Do not forget to pick up your $15 off Amopé™ Pedi Perfect™ coupon and head into Walgreens today. With this coupon I was able to get an Amopé™ Pedi Perfect™ for just $21.99. What are your tips for how to save money on a pedicure?